Aquariums, sea and fresh water aquaculture, agriculture irrigation, drinking water pretreatment, industrial water purification, water reuse, swimming pools, water parks and so on. 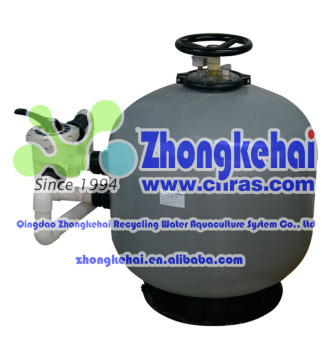 “ZHONGKEHAI” high speed grit filtration tanks for aquaculture can efficient remove various types of plankton, algae, inorganic and organic debris from water, and also soften water and improve water clarity by filtering fiber pulp, heavy metal ions, some soluble substances and protein from water. It also has advantages of small occupied area, low head loss, one valve control, easy installation and operation, high filter ability level and flexibility in use. The unique patented recoil technology can finish recoil process quickly, fully and completely to eliminate grit compaction. In this way to save recoil water and extend equipment maintenance cycle. The recoil frequency of traditional grit filtration equipment will increase higher even up to every five hours to recoil after using for a while (one or two month usually) which will reduce filtration effect. In the process of recoil, it consumes a lot of manpower and resources. When the grit floor was corrupted seriously to go black and stink, it will cause secondary pollution of aquaculture water, which is called compacted grit floor. As to above situation, our company researched and developed the “ZHONGKEHAI” high-speed grit filtration tank combined with foreign advanced technology. This equipment solves this kind of problem completely and highly improves recoil efficiency with less water consumption. The new grit filtration equipment don’t need to change the grit regularly but can be used permanently with high efficiency filtration. With comprehensive product upgrade, we expand the grit entry (view port) and grit exit and make it easier to install and change grit with the same price as before.